This card is all about the struggle on the physical level – 5’s are about the struggle and strife to attain the perfection of the 6’s – it is an inherent part of achievement – the work that goes into it and as this card is a disks card the level we are working on is the physical level. The pentagram is shown reversed and the point that goes downwards usually is pointing to the sky and this is where the physical world has become more dominant than the spiritual. The card shows how we are putting material concerns about the spiritual concerns and so are out of balance. 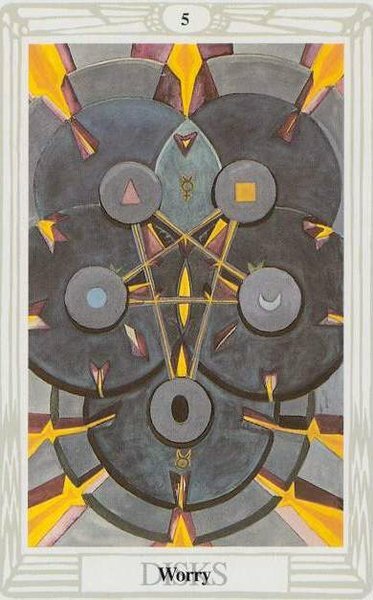 When the physical world is in service to the spiritual then things are in the right place and role and this card challenges us to do just that. To drop our worries about the material plane – work, finances, home, organisational issues etc and look to the spiritual perspective to help us through this period of time. The darkened blue is the difficulty in communicating clearly and the yellow the struggle for self worth and self esteem to show through, though the yellow also feels as if it is making progress and certainly all is not lost at this point. Each point of the pentagram is representing an element – earth, air, fire, water and spirit and each of these needs to be in balance and in its right place for creation to flow. We see too the card is connected to Mercury in Taurus – This can be seen as the card having the positive attributes of the patience needed to thoroughly think things through and come to a practical and workable solution, but also with the 5 energy in the card that this practical approach is sometimes not enough alone and we have to reach up to our spiritual higher view of the situation to see more creative and self honouring possibilities to clear the worry of the situation. Affirmations connected to this card are of the nature of….